Riddleblog - The Latest Post - Get That Horn Ready for the Feast of Trumpets! Get That Horn Ready for the Feast of Trumpets! My wife and I were speachless. Southern Illinois has the Effingham cross http://www.thecross-photo.com/The_Cross_in_Effingham_Illinois.htm . July 8, 2008 | "lee n. field"
That is weird. Pastor Kim we need a symbol of. wait what am I saying, people come to church (or at least they are suppose to) so they can hear the Word of God preached not for sight seeing like Robert Schuler’s Crystal Cathedral. What's so special about Sept. 29th? And are we going to have to march round the Earth once a day for six days and seven times on the seventh? 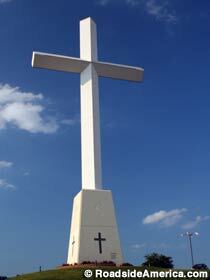 This is a picture of a cross on I-35 in Edmond, Oklahoma. The good people of the church fought like dogs to get the city to let them put it up. (Of course, they were crusading for Christ.) The church was "taken over" in a corporate merger with another, more dynamic church and is now under "new management", but it is still the same old megachurch with the liturgical used of motorcycles: I understand they occasionaly ride them down the aisles of the sactuary during the service. Priestly Vestments: I imagine there are pastors who buy this stuff who wouldn't be caught dead in their pulpits in a Genevan gown or Lutheran vestments. This is really another version of Jesus Junk for dispensationalists. Maybe the horn players should bone up on how to play taps... This gives me an incentive to dig out the trumpet again and get the chops in order. WooHoo! Ok, so I was "moved by the spirit" to join your church (i.e. I just added your RSS to my reader). How's it feel to have an ex-SBC type (neo-Calvinist [my own self-description], non-Dispensationalist, Historic Premillennialist [usually or closest description on any given day, though I'm taken with many of your eschatological writings] CCM loving, though wistful for liturgial worship guy [i.e. I don't fit in anywhwere] as a regular reader? I want to borrow your phrase "Jesus Junk for dispensationalists." Both my sons play trumpet. Can they join you on 9/29?